"My collection consists of more than 3,500 lamps and vacuum tubes. This is a wide area! In addition to well known incandescent lamps, radio tubes and cathode ray tubes, it includes, among others: arc lamps, light sources for the laboratory, transmitting tubes, camera tubes, flash lamps, microwave tubes, photocells, photomultipliers, radiation detectors, rectifiers, relays, thyratrons, vacuum gauges, X-ray tubes..."
The quality of the photos is excellent, with multiple views of each specimen. 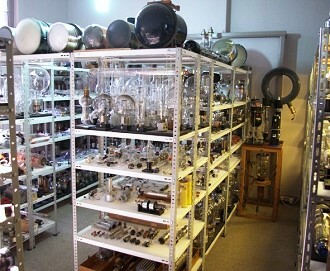 Most of the lamps and tubes in Giorgio's collection appear to be commercially produced, as opposed to the vast array of prototype and limited production tubes owned by the National Electronics Museum. You are invited to present items for sale or donation to the museum. If you happen to be in Nivelles, personal tours can be arranged by contacting Giorgio. This is a tiny example of the massive array of lamps and tubes for view . All photos courtesy of the Lamps & Tubes website.